Almost all of us gets into a deep drill panic situation when we reach home and hunt for the keys only to find them being misplaced. But the latest new unconventional app from the iOs is here to make that problem saved in a great way. This is an unique app which actually click the photos of the keys and can be easily used as an effective armour to bring out the duplicate version through the keyMe kiosk machines. With the download of the KeyMe app from apple store, it is the right away solution to losing keys tension. The download of the app will open the flood gates to a whole new worm of options to use. The official product owners of the KeyMe have opened up their venture only last year. The KeyMe is supposedly the free app which can be used extensively through iOs. It is a simple app which will store n the photographs clicked of the keys and shares them with other on the desired request. The images that are clicked through the KeyMe app an also be used in physical for a fresh ordered copy through kiosks of locksmiths and KeyMe. After the initial installation of the app from the store you need to simply scan in the physical key through iPhone to get in the image clicked in right way. But, there certain things that one needs to keep in mind while going to hit the bull’s eye. It is suggested that while a person clicks the physical scanning image through the KeyMe app, he or she must maintain certain distance to get a good picture. It is also advised that while taking the click of the key, keep a white back ground for the front and back image of the key. This is mainly done to get in a clear and accurate image while getting a photocopy of the key. After the process of the clicking of the image is done, then it switches to the next stage. Here the image is stored in the cloud. But there are certain data that the KeyMe app asks like the serial key if it has any. The KeyMe app allows the people to get in stored a multiple keys on a digital platform. As the images of the keys can be shared between the friends so anybody can scan out the images and go to locksmiths to get in duplicates. But there is one big concern to be raised while using this app, is that there no history of the key images shared. The officials of the app clearly stated, as an assumed factor that the images will be shared with the close entity, so it’s a one way dealing and no records are kept. 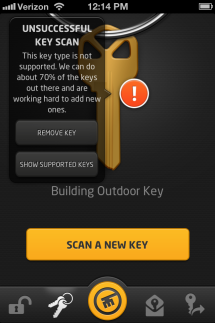 The KeyMe app is quite a reliable one as it has quite a good amount of security in case of password settings. This can turn out to be real cool app provided you keep a personal track of the keys image of being shared.